Holy crap, July went by in a blink. And hey, when did we last see a July month with 99% nice weather and bathing temperatures as if in Mediterranean countries ? Under such conditions I rather live my life off the computer, rather than pleasing the readers (if any) of this blog. I feel sorry for your disappointment at me, still this is the truth. Back on the sea, a short summary of the time passed since last. 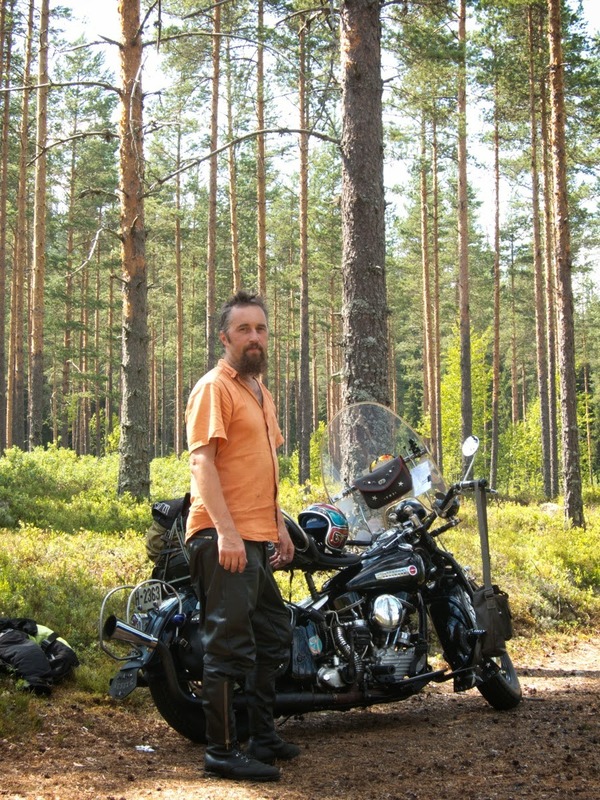 I had since quite a while planned to visit the "Fuckers chopper fest" in Dalarna Sweden along with my friend Patrick. My bike for this ride would have to be Bessie, not much of a chopper! 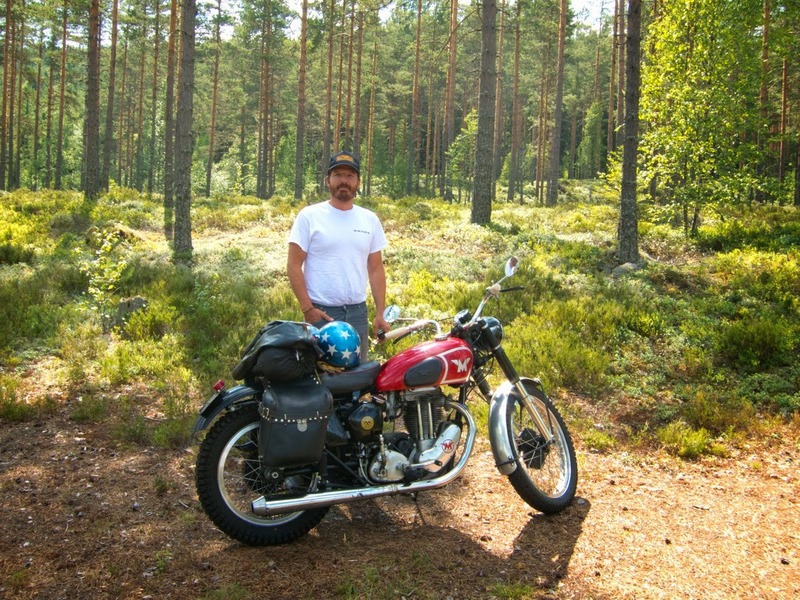 On the other hand my friend Patrick rode a Matchless, neither a chopper nor an US bike, still a very cool motorcycle. Prior to the ride I had to change my primary chain, it appears I had run this to dry, shame on me. I also replaced the adjustment screw on the oil pump for this chain, as the original set up is by shim, whilst the later have a lock nut. Had to ride from South Norway to Oslo to catch up with Patrick, chose the main roads as this was transportation only. From Oslo we found some really nice country roads for the remaining 400 km`s. When almost there at the Fuckers I suggested we picked a really small road on the map to get to the goal faster, that was a MISTAKE. We ended up getting really lost on Swedish gravel roads, no signs, had to ask people for directions, oh my is Sweden sparsely populated even in Dalarna. I should mention Bessie almost ran out of battery too during this last part with gravel roads, she died every time I used the rear brake due to the brake light came on, no so convenient!! When arriving at the Fuckers friday evening we found we were the only ones there, eh except from the local organizer. Fuckers normally arrive at Saturday, hey that came out wrong, Fuckers starts at Saturday. I got my best sleep in a long time in the tent that night, at Turbo festplats in the middle of Swedish nowhere, not a sound to be heard. Saturday showed up with great weather, and a very very quiet morning, just the birds sang, still no "Fuckers" other than me, Patrick and three young guys from up north in Sweden that had arrived late Friday. During lunch time more Fuckers started arriving and I learned to know a bunch of great people I had not met before. Sometime around two o'clock a crowd of Jokers and a bunch of their friends arrived and the place started getting packed with bikes and folks. Who was there at Fuckers? Many whom I knew from other events trough the years and some I learned to know now, guys from Sweden, UK, Belgium, Finland, US and Germany (I think that was all?). Afternoon there was supper served by the organizers, something chili that got more than my internals to get into some heavy digestion work. People chilled with Swedish beers (I say no more) and Patrick was busy in capturing most of the bikes with his camera. Later on a band started playing and there was more talking and lying and suddenly it was early in the morning and time to get some sleep before leaving. Took off at lunch time and rode "NOT" the fastest way from Turbo Festplats but rode some paved roads this time. Had some rain showers on our way back to Norway, but mostly we zigzagged between the downpours. Having crossed the border I left Patrick by himself, he was to ride to Oslo whilst I was heading North to continue on tour for another week (but that is another story). Who dosent want to be out and enjoying the Scandinavian summer, when it is like the one we had this Year....!! Allways a joy Reading Your blog ! Patrick, indeed we have had the best summer months in years, April and May included. You should have been at the Fuckers to get inspiration for your build! !